When it comes to newly built houses, the positioning of a chimney or stove and of the related flue may be decided on paper, simultaneously to the overall design. This, however, is not the case of restructuring work where a flue is already present, since it becomes more difficult to be able to position the chimney exactly where you would like it to be. The fireplace, whether it is a wood-burning or pellet-burning one, is not an independent element, since it needs a proper flue in order to function correctly. In fact, a correct flue is responsible for ensuring a perfect draught, thus providing a chimney that warms well with no smoke downdraught and a nice clean glass. First of all, we need to say that what we normally call a "flue" actually consists of two elements. The first element is the "smoke duct" or "smoke fitting", which can also have an irregular configuration and, by all means, connects the chimney or stove to the actual flue itself. The flue is more precisely the insulated pipe that comes out of the roof and reaches the chimneypot. The combination of a flue and smoke fitting is called "flue system". Below, we will see the typical configuration that a flue system must have in order to dispose of smoke from a wood-burning fireplace or a pellet-burning product (stove or fireplace). 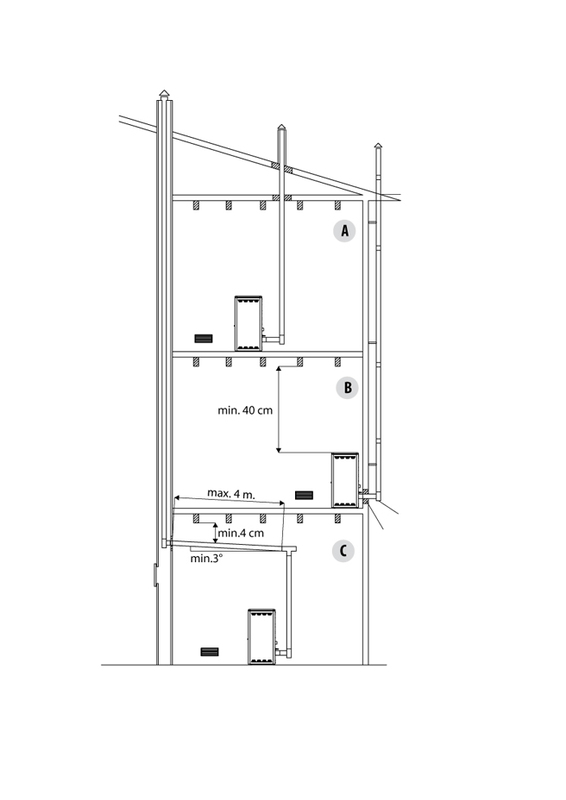 CONFIGURATION: The smoke fitting must be configured as vertical as possible with a maximum 45° slope. There may be more than one bend. MINIMUM LENGTH: The flue system used to dispose of wood smoke must measure at least four metres in total. MAXIMUM LENGTH: There is no maximum length limit, however, we need to make sure that its length guarantees draught. In order to ensure an adequate heating performance, the draught must always be between 8 and 12 Pa when hot (measurements must be made by a chimney technician). CROSS-SECTION: The cross-section of the flue may vary depending on the product used or on the overall height of the system. In any case, it should never be smaller than the diameter of the smoke outlet collar of the appliance, which is usually 15 cm. CONFIGURATION: The smoke fitting for pellet products can also be configured horizontally in parts, however a slope of at least 3% is always recommended. In any case, more than three 90° bends are to be avoided ("3T rule", excluding the T fitting on the output of the appliance) and the horizontal sections should not exceed three metres. 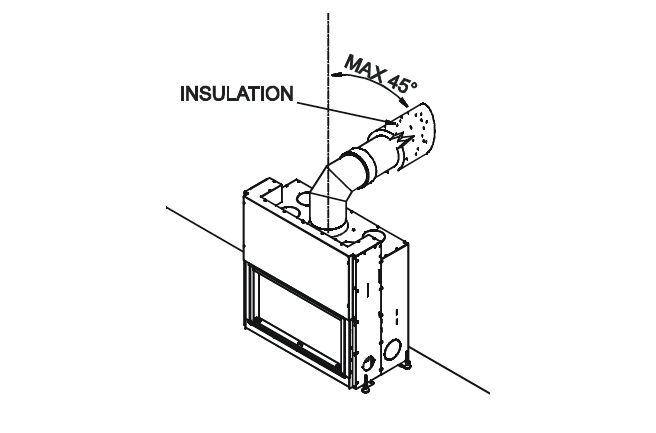 MINIMUM LENGTH: The smoke fitting must have a minimum vertical length of 1.5 metres. MAXIMUM LENGTH: The maximum length of the smoke fitting depends on the configuration of the pipe: if there is only one 90° bend, it can reach six metres, whereas if there are three bends, the maximum length decreases to four metres. CROSS-SECTION: The diameter of the flue of a pellet product is significantly smaller than the one used for the discharge of wood smoke. In fact, the difference is 10 cm against 25-30 cm in the case of wood. In any case, the flue must have a larger cross-section than the smoke outlet of the product used, which is usually around 8 cm. The three solutions presented above represent typical installation of pellet products. All of them are perfectly regular. SOLUTION A: the flue "pierces" the ceiling and go directly to the roof; even if the floor is not made of flammable materials, both the flue and the ceiling still has to be added to a suitable insulator. SOLUTION B: from the stove there is a pipe that goes directly out of the "wall" and reaches a flue, which is built outside the building; in this case, it must be used exclusively insulated double-walled stainless steel tubes, securely anchored to the wall; the chimney must be "wind-proof". SOLUTION C: a smoke duct with a peculiar configuration has been created in order to reach the already existing old chimney.